Birth Certificate is one of the most important and useful identity which is issued by government of India. Here I will tell you how to apply birth certificate online in India. Basically birth certificate gives full information about children such as like place of birth, gender, date and time of birth, name of children, and parent names ect. Birth certificate is most important during admission of school, college, or any university. Even birth certificate is required for obtaining identities like voter id, Driving license, and passport and Marriage certificate. Even birth certificate is very necessary for getting job and some health schemes and during passport application. Sometimes it may also useful for applying green card. 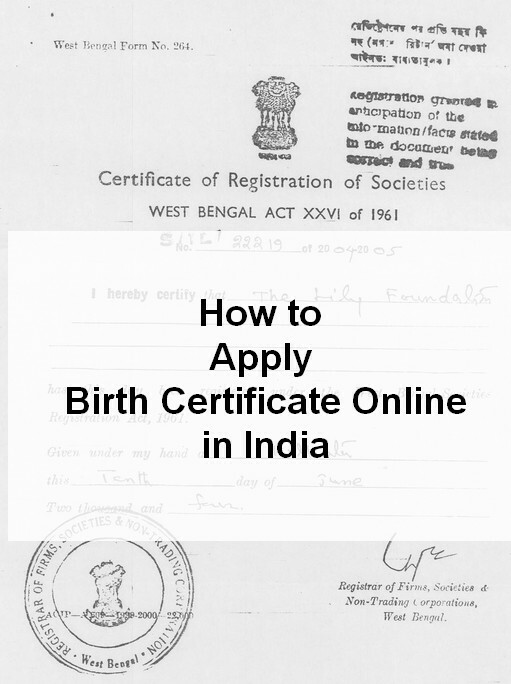 Here I will share with you how to apply birth certificate offline mode in India. Everyone must be aware process of applying birth certificate. The first thing is you need to register your child’s birth. This process can be done within 21 days from birth of child’s. Basically birth certificates are necessary records that keep on files birth of child in nearest place like Municipal Corporation office, panchayat and hospitals. There are few documents required during apply time. Just take a look here. Parent’s identity proofs for verification. First you need to go to municipal corporation office then get a birth certificate registration form from municipal office. Now you have to submit the letter that was issued by hospital. This letter was given by medical officer in charge. You have to fill the form within 21 days birth of the child. After that they will verify the birth details like place of birth, date, time, parent’s name, parents, proof, nursing home, gender ect. After 7-15 days you will get birth certificate on your address. If there is any urgent you can get directly on municipal office within one week. Some of the state in India has started giving birth certificate online. Here i am providing the link, there you can search your state for applying birt certificate online in India. Just go to GOI SEARCH and search for birt certificate. Now you can look for your city or state then you can fill the online form to apply birth certificate for your child. Birth certificate is very necessary identity for who’s live in India and without birth certificate you cannot able to get any certificate which is issued by government. while applying birth certificate you need few documents such as like birth certificate of parent’s, marriage certificate and identity proofs. I hope this article useful for you.